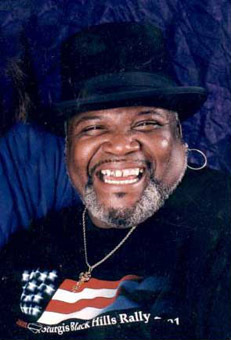 Buddy Miles began his musical career at twelve when he joined his father's jazz band The Bebops. As a teenager Miles played in a variety of bands including Ruby & the Romantics, the Ink Spots and the Delfonics. In 1967 he formed Electric Flag with guitarist Mike Bloomfield. While the lead vocalist for the Flag was Nick Gravenites, fans of the Flag always looked forward to the numbers sung by Miles. Listen to the slow blues song "Texas" by the short-lived Flag and you will get a sense of what Miles brought to the group. The group broke up after their 2nd album, and Miles formed the Buddy Miles Express. After Electric Flag, Miles would begin involvement with the legendary Jimi Hendrix. Miles had met Jimi Hendrix in an earlier time when both were acting as sidemen for other artists in the early 60's. The meeting had occurred in Canada at a show both were participating in. This prefaced a later friendship that would result varied collaborations between the two artists. An extremely busy Hendrix would produce the Buddy Miles Express release, "Electric Church" in 1969. There was obvious public curiosity as to whether the name of the band "Buddy Miles Express" was influenced by Hendrix's act, "Jimi Hendrix Experience". Soon after, Jimi Hendrix started opening his recording style to now include guest artists. And in this mode Hendrix was working in, Buddy Miles quite naturally was invited to participate. He played with Jimi Hendrix on the hugely influential Electric Ladyland album. Miles played on the songs "Rainy Day" and "Still Raining, Still Dreaming". Soon after the release of this groundbreaking album, he would join Hendrix in a short lived band called "Band of Gypsys". One of the notable features of this band was the fact that all of the players were black. This was a first for Hendrix as an international recording star but his choice of players resulted from musical preferences and not racial ones according to all published sources concerning the act. Recordings with Miles show a more soulful style of Hendrix playing than with his all white backing act, "Jimi Hendrix Experience". This act, "Band of Gypsys" was based in New York City where Hendrix was spending the majority of his time. Hendrix, who was tangled in legal litigation concerning contracts he had signed in the past prior to his becoming internationally recognized, was required to release a record to the Capitol Records label as part of the agreement in court. This fact led to the live recording of his collaboration with Buddy Miles and Billy Cox. The Band of Gypsys made a famous and enduring live album that was recorded in New York's Fillmore East on New Year's Eve 1969/70. However during a follow up performance a month later, Hendrix had a minor, drug-related meltdown on stage and Miles was fired by Hendrix manager, Michael Jeffery. Miles continued to work with Hendrix during mid and late 1970 after his "Jimi Hendrix Experience" had failed to reform to record. Miles would share recording studio drumming duties on songs that would appear on records released after Hendrix's death such as "Cry of Love" and the controversial "Crash Landing" produced by Alan Douglas. Buddy Miles went on to produce other records under his own name. A song he had written and recorded with the Band of Gypsys, "Them Changes" was again recorded by Miles with his own band on a release soon after Hendrix's passing on Mecury Records. By this time Miles had dropped the "Buddy Miles Express" act name and shortened it to just his own name, Buddy Miles. That band included bassist David Hull (who would go on to work with Joe Perry of Aerosmith) and guitarist Charlie Karp. The same band would release a live album entitled "Live" which again included his by now signature song, "Them Changes". Miles would see the song released yet a fourth time on a collaborative live record he made with none other than Carlos Santana. This particular version was particularly notable for its intense energy, horn lines and blazing guitar work supplied by a very young and energetic Santana. Miles would then go on to be signed by the 70's-80's ear record label, Casablanca Records, best known for their rock act KISS. Miles' work for the label included the excellent album released under his own name, "Bicentennial Gathering of the Tribes". It would include on its liner notes a quote from President John F Kennedy concerning the American Indians. That quote would include the line "When we neglect the heroic past of the American Indian, we thereby weaken our own heritage". This was interesting in relationship to his former friendship and collaborations with Jimi Hendrix who, in fact, had much American Indian blood in his family line. It should not go unmentioned that part of Miles' appeal as a rock musician was his physical appearance. He drew many stares and smiles as he held court from the drum set in the Electric Flag days, with his American flag or sequined shirts, his high-brushed Afro, and his massive frame and smile. Buddy was an eyeful for the hippies and concertgoers of the day. In 1986 Miles performed vocals for the California Raisins claymation ad campaign, most notably singing I Heard It Through the Grapevine and was also lead vocals on two California Raisins albums featuring 1960's R&B covers. In 1986 and 1987, after spending the late 1970s and early 1980s incarcerated for drug charges, he also rejoined Carlos Santana as a vocalist on Santana's album Freedom. Buddy Miles was seen in the Hendrix-family-owned, official video release The Making of Electric Ladyland on Rhino Records. That video featured interviews with the majority of players who were involved in recording the legendary Hendrix album. Miles even went as far as to be video recorded playing his same drum tracks yet again in the studio to the original multi-track recordings of Hendrix. In 1999 Miles appeared on the late Bruce Cameron's album, Midnight Daydream that included other Hendrix alumni Billy Cox and Mitch Mitchell along with Jack Bruce and others. In 2004 Miles reunited yet again with Billy Cox of the Band of Gypsys to re-record songs from the original live album of 1970 with a trio of guitarists that included Eric Gales who had gained fame on his own already.